NO FOOLING!! NEW LOW APRIL RATES!! Top Floor condo with beautiful views!! Nicely furnished and updated 2 bedroom, 1 bath condo with large balcony. 7TH NIGHT FREE! ......3 NIGHT MINIMUM STAY. *minimum age to book is 24. Gulf Shores Surf and Racquet Club is a beautiful resort with a tropical feel. The property faces the beautiful white sandy beach and clear emerald waters of the Gulf of Mexico on one side and Little Lagoon on the other. While your here enjoy our private beachfront with its own pavilion or use one of the complexes two piers on the lagoon for fishing, boating or just enjoying the beautiful sunset views. The lush landscaping provides a tropical feel around the pool and surrounding amenities. A hot tub, kiddie pool, lighted tennis courts and shuffle board offer entertainment for the entire family. Charcoal grills and a party pavilion are also available for our guests. Located on the 7th floor enjoy gorgeous views of Little lagoon and the tropical pool area from the balcony, living area and bedroom. We know you will be comfortable in our recently remodeled condo that is beautifully decorated in costal colors and furnishings. A queen size sleeper and 2 queen beds sleep 6. Our kitchen is equipped with all you will need to prepare meals in or choose a local restaurant nearby for which we have provided menus. Catch your favorite TV. programs on flat screen televisions in the living room and bedroom. Watch a DVD, or surf the Internet from any room you like inside or out. We provide a beach cart for your convenience. Gulf Shores is a great place to relax and have fun. You will find local golf courses designed by some of the best known names in the sport, great shopping (a outlet mall is just minutes away), restaraunts and live music nearby. For the adventurous type we have world class fishing, boating, and parasailing. For the child in you there are theme parks, miniature golf, dolphin cruises and a zoo. We hope you'll choose to stay with us your next visit and see for your self why our guests keep coming back! After visiting Gulf Shores for our 25th wedding anniversary we decided we wanted it to be more than a vacation destination but a way of life. 1 year later we found our selves enjoying the beautifull beaches and relaxed lifestyle this community offers. 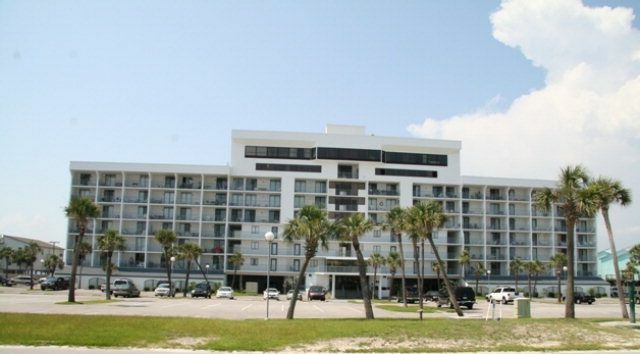 Gulf Shores Surf and Racquet club offers the best of the Beach and the laggon. The pool area is one of the best we had seen. Affordability and a great family atmosphere makes this a great vacation destination. Beautifull sunsets from the peirs, boating and fishing on the lagoon, and our private beach within just a few steps. Low traffic and yet everything, resteraunts and shopping only a few miles away. Gorgeous lagoon views from the large balcony. Gulf View from 2nd bedroom and entry. Lagoon front with private beach access directly across the street. The best of both worlds. We really enjoyed our accommodations and thought the property was beautiful. The large balcony is a great spot for relaxing with awesome views of the lagoon and pool area. The beach is just a few steps away and the water and sand are gorgeous. Very nice and clean. WiFi did not work well but everything else was great! Clean, comfortable condo across from beach. Well maintained and furnished. The beach is right across the street. The beach was very nice. A little crowded in town but manageable. Debbie suggested a few restaurants both in Gulf Shores and Orange Beach which we enjoyed. We especially enjoyed the Gulf Shore Seafood which is take out and had the “royal red” shrimp Cajun style - delicious. If you have a family with young children and love the beach this is definitely a great vacation spot. Condo facilities are well kept. The condo balcony faces the pool and lagoon which can get quite noisy but the pool closes at 11pm and they adhere to that. Overall great experience! Nice and clean condo by the beach! Condo was ok... view was disappointing! Based on the photo of the building which just shows the front of the resort.. it did not show the U shaped building with condos in the back... I wanted a view of the ocean!! It was convenient having the elevator outside the door since I was recovering from knee surgery! I did not like the surprise charge of $20 to park.. first time ever! Anyway the condo was nice and clean but I just wasn't happy with location so we left a day early and stayed a night at another location.. The photos on the listing show the view from the balcony. It is a beautiful view of the lagoon and pool from the top floor. Just miniutes from The Hangout a popular family destination for live music, great food and fun activities for the children. Miniature Golf, The best little Zoo ever . Waterville waterpark and amusement park are just 3 miles away. A popular shopping destination is just another 6 miles north at the Tanger Shopping Mall. Cancellation policy: Cancellations made 30 days prior to arrival will be eligible for a 100% refund. cancellation requests received post 30 days will be eligible for a 50% refund and cancellation requests made 14 or later prior to arrival are not eligible for a refund.